One thing I am always asked by clients + friends is “What tools do you use for your lettering? 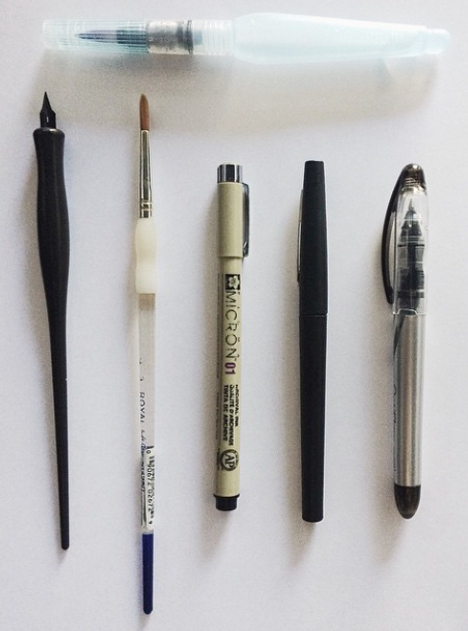 !” And just recently, a follower on my personal Instagram account (@hannahbusing) asked me if I would write a post on my favorite tools I use for lettering. Not once had that ever came to my mind (probably because I am not a natural writer) but, I thought hey, why not?! & I am so so so thrilled to write my first post on this for my fellow letterers. What I love most about handlettering is everybody’s lettering is different in some way. Each person’s writing has it’s own uniqueness, style, tendencies. I love that about it. C A L L I G R A P H Y P E N // the Calligraphy pen is a tool that is fairly new to me. I am self-teaching my self, and even with all I do not yet know about it, I have come to love it. There are classes you can take (in person + online) to learn calligraphy- note* they are pretty pricy. When you’re in college and working full time like me, you don’t have the time or money for that, ha. I have found it really is not difficult to learn on your own. Google free tutorials or Youtube calligraphy tutorials and you should do fine. R O U N D B R U S H // SIZE 3. For fun lettering, I use a SG250 Royal soft-grip roundbrush – size 3. They are well-priced and give my lettering the perfect shape and brush look I am looking for. I do not use this to paint with acrylics on canvas. I mostly use it with acrylics on wood, or with watercolors. M I C R O N S // Microns!! ahhh my favorite of all. They are my favorite archival ink pens. They come in a variety of sizes, but my favorites are the .01, .03, and.05. You can buy them seperately or all together. The first time you use one of these, you will be sold. One of my best investments. F E L T P E N S // Felt pens are one of the most underrated pens I know of. THEY ARE WONDERFUL. and cheap.. which makes them even better, ha. They give off the ink look I want for day-to-day practicing. They also come in different point sizes, but I only use the fine-point and medium tips. O P T I F L O W // oh my. The OptiFlow pens are incredible. Definitely my favorite eveyday writing pen. I fall in love all over again everytime I use it. When I use this pen, I use it for taking notes at school + church, for doodling, and I have even used it on some of my prints. The ink flows so smoothly + easily. You will fall in love. W A T E R B R U S H // I use this tool mostly for watercolor backgrounds, and for lettering when I am traveling. You fill it up with water, grab a watercolor set (don’t use the cheap ones) and start painting. You can also fill it up with a pigment mix if you choose. This is very affordable, but a little pricier than the other tools. & it is worth every penny. [not pictured] My last favorite is the Tree House Studio paint pens. I do not have a picture due to the place that I purchase them from has had a MAJOR shortage the past few months.. talk about driving someone crazy. They come in any color you could possibly think of, but I only use the black. These are only used when I paint on top of acrylics. Well-priced and have a paint-like effect to them. If any of you have any additional questions, feel free to shoot me an email at info@gracemadestudio.com & I would be more than happy to answer any of your questions. You can also check out my Instagrams & see how I have used these tools on my work (@hannahbusing & @gracemadestudio). Enjoy experimenting, I hope these tips are put to good use ?